There are some things in our lives that take a lot of prayer and a lot of faith to overcome. But why is it so hard sometimes to stand in faith for those things? D.L. Moody spent many hours praying for faith. He once said, "If all the time I have spent praying for faith was put together, it would be months. I thought that someday faith was going to come down and strike me like lightning. But faith did not come. 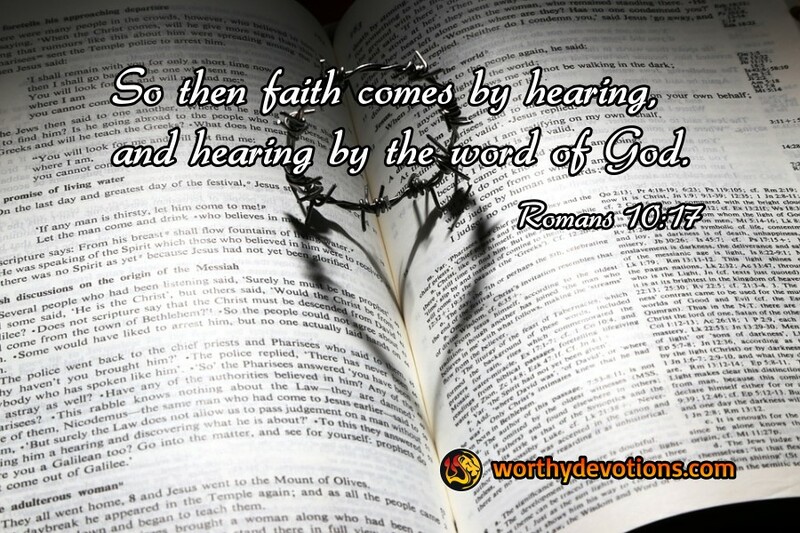 Then one day I read in the 10th chapter of Romans, "So then faith comes by hearing and hearing by the Word of God." I now opened my Bible and began to read God's Word and faith has been growing ever since." Much of what we believers describe as 'faith' has nothing to do with Biblical faith. Our faith must not be based on emotion, or want, and not on the latest exciting conference or revival. But it must be centered on God's Word, on Yeshua (Jesus), His death and resurrection, His salvation. The Living Word is the eternal, everlasting love of God which has been poured out upon our lives. Let's read, hear, apply and live the Word today, and we will grow strong in faith! There's so much work to be done! Fight on the Hidden Battlefield -- and WIN!